To be honest, the world of prisons has always fascinated me. I have always wanted to know more about jails and wanted to help people that are held behind bars. This strange relationship I have with prisons started in my childhood. When I was a child I used to enjoy spending hours and hours in front of our home’s bookcase reading titles, discovering authors’ names, and leafing through the different books before choosing the one that would be my companion for some days and nights. The hours I spent there were some of the best of my life. During those journeys into the world of books, I made discoveries. Indeed, when leafing through the books I noticed the presence of my father and some of his friends/ comrades’ names on the first page of some of them. I also came across some letters or papers with prison stamps. I understood that those books were my father’s’ books in jail. I already knew that he had spent some years of his life behind bars as a political prisoner. I have always been eager to know more about that experience and to understand it. I also had the opportunity to see some of his photos taken in prison. 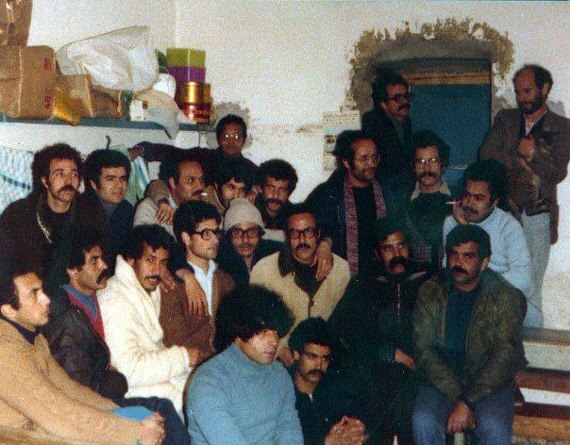 Moreover, I discovered the majority of the Tunisian prisons (from outside of course) as my father has always had the habit to take us on long journeys across the country to discover its nature, archeological sites and guess what; the prisons where he had spent some months and years. 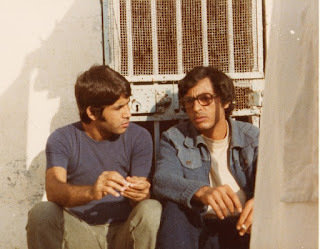 He also used to tell me some anecdotes about things he had experienced in jail. Some years later, some of my friends had been arrested and jailed for political reasons or for cannabis consumption and upon their release I always had questions about the prison and its conditions. As a blogger dealing with human rights issues, I have always worked on cases of violence and torture against prisoners. I even wanted to visit some of the Tunisian prisons but this seemed to be a hard endeavor, something impossible. This is why I did not hesitate at all and actually became excited when I had the opportunity to do so. Last November, I visited some prisons within the framework of the prison-screening series organized by the World Organization against Torture and the Carthage Film Festival. I visited la Morneguia and Manuba’s prisons. On our way to the screening room in La Morneguia’s Prison, I noticed the presence of a library. Curiosity drove me inside the room where I had a long discussion with the librarian. The latter showed me the different books on the shelves and told me about their sources and the mechanisms of their distribution to the prisoners. I also asked him about the possibility of offering books to prisons. He explained that this was possible after the submission of a request to the General Directorate of Prisons and rehabilitation centers. The same night, I had a discussion with my father who is more experienced than I am when it comes to jails, their conditions, and their internal laws. I asked him about his personal experience and I learned that with his comrades they had had recourse to hunger strikes to claim their right to read behind the bars. He also gave me some numbers and realities about the incarceration world. Then, I expressed my worries as to the subjects of some of the books I saw on the shelves of the prison library. Indeed, they were Islamic fundamentalist in nature. I immediately recalled some of the studies and articles presenting jails as one of the most fertile grounds for the indoctrination and recruitment of Tunisians by extremist groups. In la Manuba’s prison, however, I did not have the opportunity to see the library. 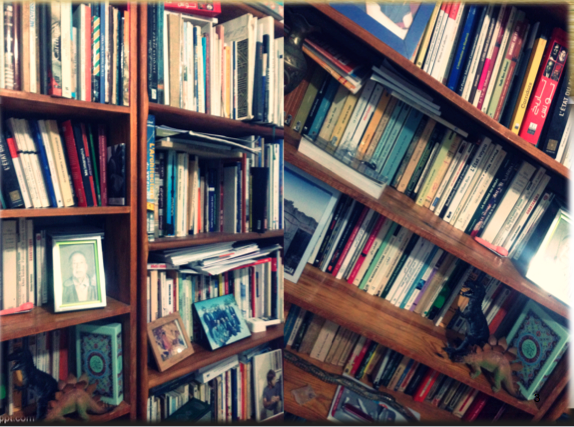 Later on a friend that had been arrested there told me that only two bookshelves were available for prisoners. 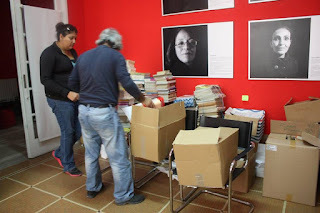 With my father we first decided to follow the procedure indicated by the librarian we met in la Morneguia’s prison and send some of our personal books to one or two prisons. But a thorough examination of the situation and a look at the statistics related to Tunisian prisons and rehabilitation centers as well as to the: Standard Minimum Rules for the Treatment of Prisoners Adopted by the First United Nations Congress on the Prevention of Crime and the Treatment of Offenders, held at Geneva in 1955, and approved by the Economic and Social Council and a thorough study of the report of the Office of the United Nations High Commissioner for Human Rights Tunisia Office entitled: Prisons in Tunisia International Standards versus Reality was sufficient to convince us of the necessity of acting on a larger scale and try to help in changing this situation. To be sure one of the main missions of the prison is: the rehabilitation, re-education and reintegration of the prisoner in his/her community after having served his/her prison sentence. A large number of male and female prisoners who are in their early twenties and engaged in university education were in the process of serving a prison sentence as a result of their committing a drug-consumption crime -. In this context more than 53 percent of the total number of prisoners is accused of holding, consuming or dealing. Every institution shall have a library for the use of all categories of prisoners, adequately stocked with both recreational and instructional books, and prisoners shall be encouraged to make full use of it. 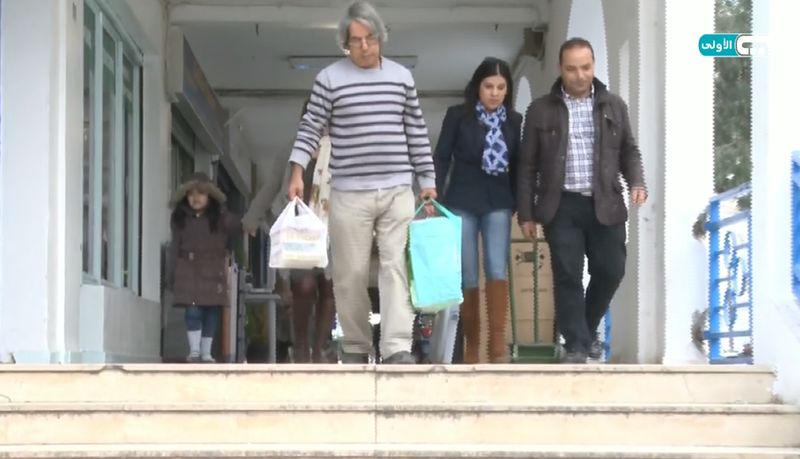 The prisoner is entitled to continue being informed of what is happening in the outside world, through access to writing instruments, reading books, magazines and daily newspapers through the prison administration under the regulations of the institution. Every prison should have a library with books and magazines for reading. A prisoner is also allowed to obtain other written documents enabling him to pursue his educational programs in educational institutions from inside the prison. 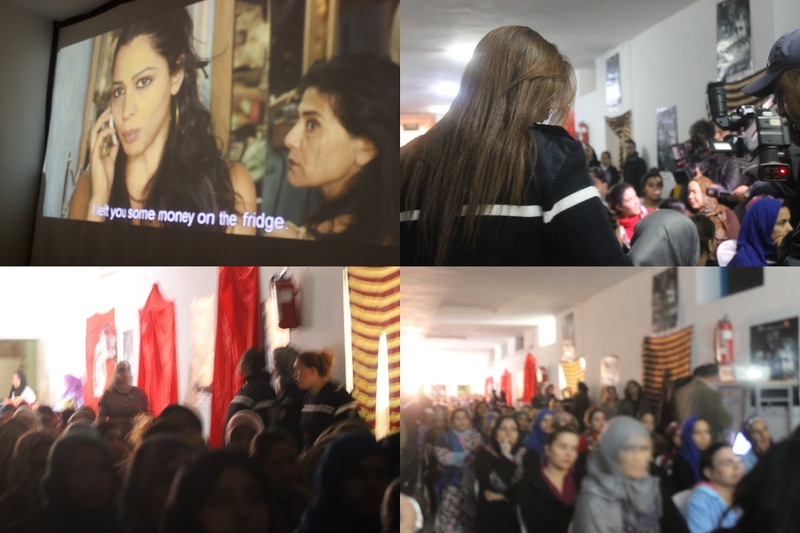 Musicals and theatrical performances are organized in spaces inside the prison and are produced by detainees or made in cooperation with the cultural and youth structures in the region. Exhibitions are also organized inside the prison facilities or the products of cultural clubs, such as paintings and creations, are exposed in regional and local exhibitions. But, the programs implemented in the Tunisian prisons according to this rule, could be considered as “poor” for several reasons including lack of possibilities and budgets. The use of books available in some prison libraries is almost non existent, which is therefore reflected in the administration’s lack of interest in feeding it with new books, magazines and other cultural materials. In terms of the prisons’ budgets as revealed by the directors, there are no financial allocations earmarked for the purpose. 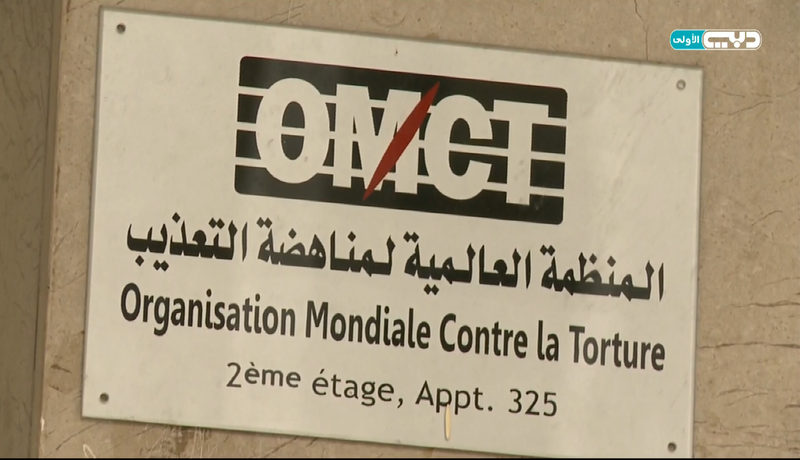 We thus decided to launch a larger initiative relying on social media and the generosity of Tunisians as well as the collaboration with the World Organization Against Torture that has already a cooperation agreement with the General Directorate of prisons and rehabilitation. On February 11th, 2016 I announced the beginning of the initiative on my personal Facebook Profile. 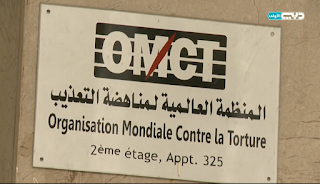 I included the address of the Tunisian office of the World Organization Against Torture as our main drop off point and two phone numbers. People started to share it immediately. It went viral. Few minutes later, I received the first call from someone who wanted to give me some books. 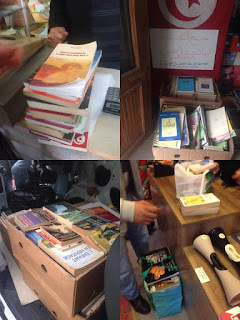 The day after, with my father we were on our way to Sfax when a woman called me to inform me that she wanted to give us some books but that she was far away from the capital. She was in El Jem, 30 minutes later I collected the books she had prepared for the collection. Many local and foreign journalists contacted me and wrote articles and did reports about the collect. I was really happy to see the enthusiasm of all those generous persons who believed in the importance of such an action. I decided to launch a special page for the initiative and two months later more than 2500 person are following it and interacting with us as to the initiative. We had already collected more than 10000 books in different languages. 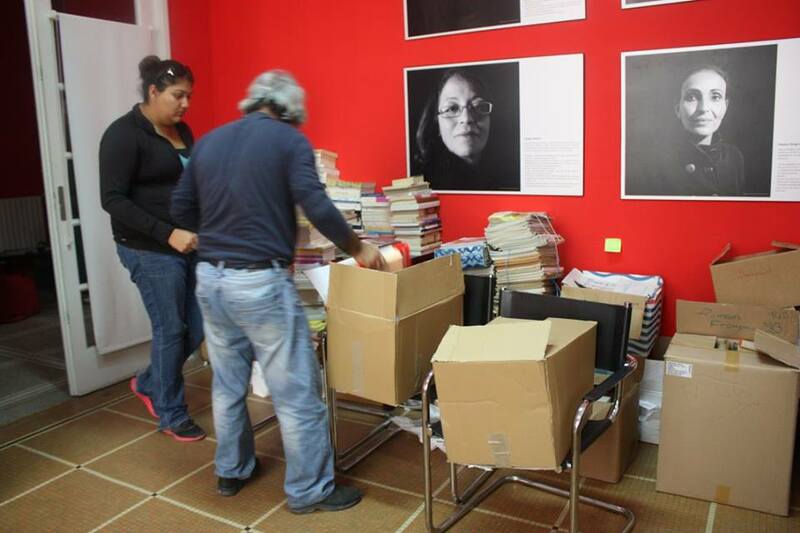 We also received books from Tunisians living abroad and even from foreigners. -3 points in La Marsa. -1 point in Le Kram. 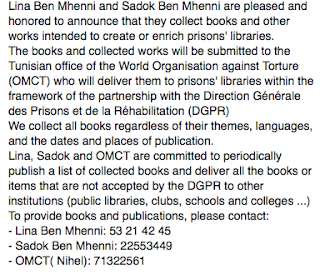 On April 5th, 2016, we delivered a first set of books to the General Directorate of Prisons and Rehabilitation Centers. Now, we are still collecting books. The initiative is open. It is not limited in time. As a first step we are targeting the collection of 15000 books in different languages to be delivered to the 27 prison and rehabilitation center across the country. Now, we are studying the possibility of enrichment of the initiative through the organization of reading and writing workshops and other cultural activities. The initiative is our small contribution in the dissemination of the culture of human rights among Tunisian citizens and in the national effort in the fight against extremism and terrorism, as we believe that books can change many lives and minds.